We here at Tiki Island Life have an interest in helping everyone find their inner Tiki (and their inner island)!! Let’s face it, life is busy and getting more so all the time. Today many of us are asked (ordered) to do more with less,-often FOR less. That’s stressful. Often there is very little we can do about it, short of making major changes in our lives or lifestyle,- changes we may not easily be able or willing to accomplish. As most of us know, however, peace does not come from external circumstances or our environment. It comes from within, from our way of thinking, appraising the world, assessing the world and deciding those things upon which we will focus our attention, and which things we will allow to be less of a focus. It is our hope that by helping others understand these ideas, and by carefully creating beauty in our environment (landscape, home, our thoughts) we can help others create their own Tiki Island Life. Where we retreat after a hard day,- and even after a good one! It was not always this way, however. We came from “up north” where it’s cold, snowy and icy for 6 months of the year (well not really 6,- it just seems like it). Even in that “northern environment” we began to visualize our tropical paradise. We began to accent our house with container palms, split-leaf philodendrons and banana plants (yes some are hardy even up north). Sand in decorative containers gathered from previous trips, photos of our favorite ocean beach and a couple of steel drum CDs completed the picture. At that point, we were already living our Tiki Island Life! The imagination is a very powerful thing! 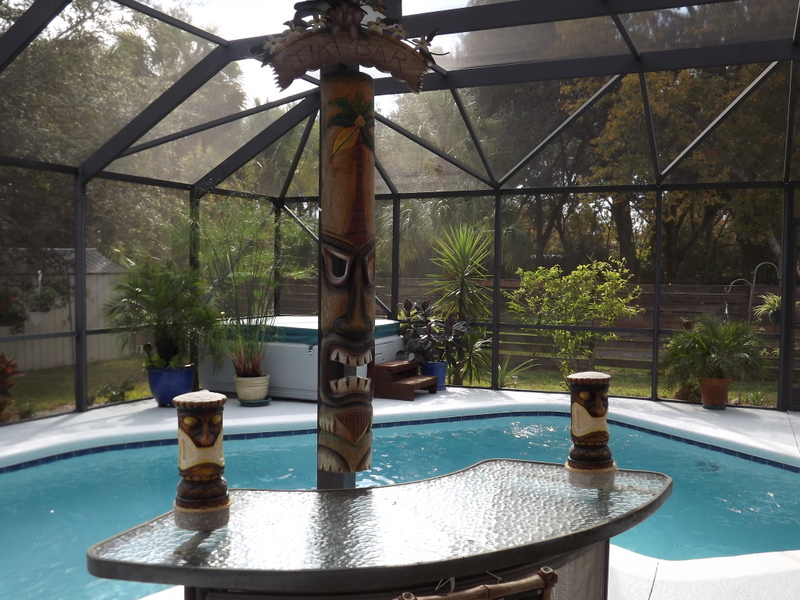 We recently had one of our beloved Sabal (Cabbage) Palms die. 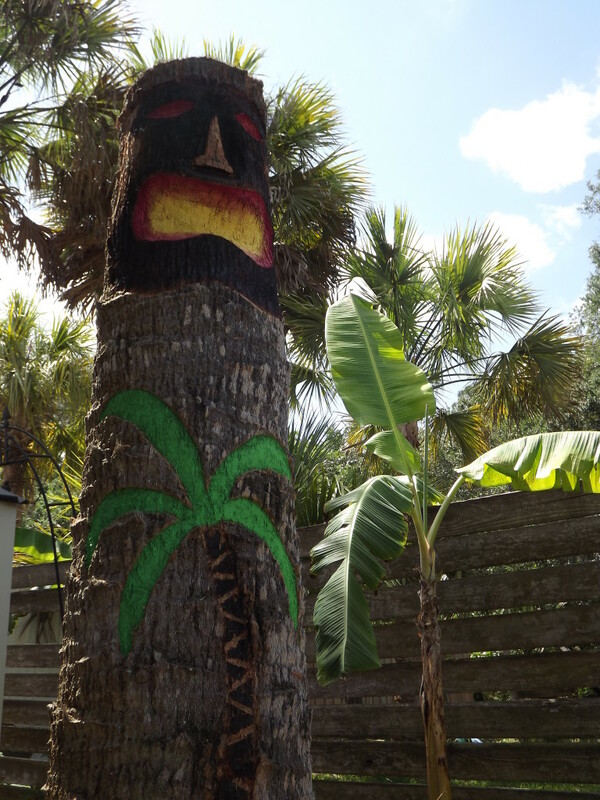 While it was a sad thing, we decided to make the best of it,- If life gives you dead palms, make tikis out of them!! I know this tiki is not really a great one. Palm tree trunks are not really “wood,” but rather really stringy, dense, spongy, cellulosey stuff,- sorta hard to carve. All in all, though, I think it came out OK, for a first attempt. Also, now that it’s in our yard standing guard (like tikis do), our home is protected from all sorts of evil!